Patel Conservatory: From the Blog: Guest blog: In the Big Apple! Guest blog: In the Big Apple! Guest blog by Tina James, Patel Conservatory Education Programs Manager for the Patel Conservatory. Tina’s primary responsibilities include overseeing the Conservatory’s Community Partnership program as well as all community-based programs involving Broadway Family Nights, Family First Night, National High School Musical Theater Awards as well as National Broadway League initiatives. I’m in the Big Apple with Chandler Morehead and Tim Hart, winners of the Straz Center’s Broadway Star of the Future Award. 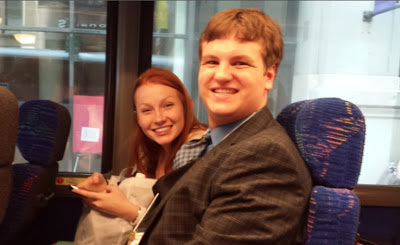 As you may recall from an earlier blog post, Chandler and Tim won this year’s award during the Florida State Thespian Festival in March. Chandler Morehead is from American Heritage School in Plantation, Fla., which happens to be the same school of Joshua Grosso, who was last year’s overall Jimmy Awards winner! Chandler won for her performance of Meredith Parker in Bat Boy The Musical. She is a 2013 graduate of AHS and will be attending Texas State University in the fall. Tim Hart is a junior/rising senior from Palm Harbor University High School in Clearwater, FL and he won for his performance of the Baker from Into the Woods. Chandler and Tim are only two of 62 nominees vying for the coveted Jimmy Award during this year’s National High School Musical Theater Awards. To see a list of the other 60 nominees, visit the NHSMTA website. 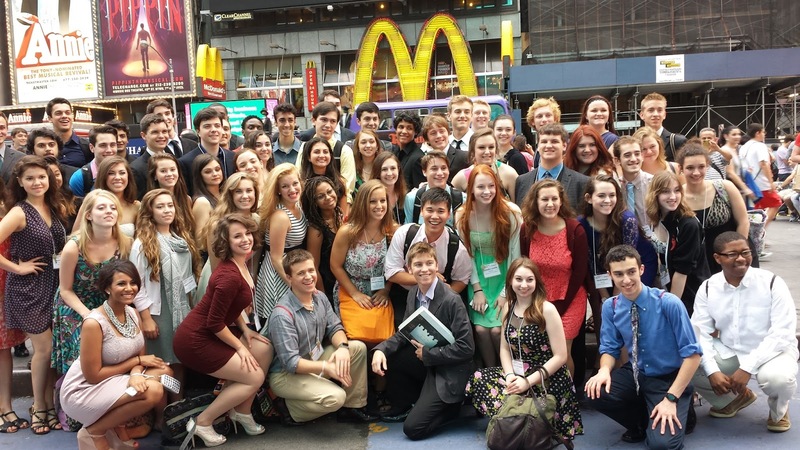 High School Musical Theater Awards in New York City this week. We arrived in NYC on Wednesday, June 26. Since then, we have (or should I say they…LOL) have hit the ground running. The nominees had a chance to get to know one another and meet everyone at a pizza party sponsored by Papa John’s. After the party, they went straight into music rehearsal and began working right away on the opening number until about 10 p.m. The next day they were at it again as early as 8:30 a.m. with medley vocals and solo coaching. During Thursday’s lunch the nominees were treated to a talk-back session with special guest Kirstin Tucker from the Tony®-Winning musical - Rodgers and Hammerstein’s Cinderella. Kirstin has also performed in the national tours of West Side Story and A Chorus Line as well as numerous regional theater productions. Later that evening, the nominees had dinner at the world famous Sardi's Restaurant. After dinner the nominees had a night out on Broadway and had a chance to see Annie, starring Jane Lynch of Glee. Following the performance there was a special talkback. To see more photos visit the NHSMTA flickr page. Check back for more updates…write with you soon! What a fun trip Tina! Congratulations to Chandler and Tim too! I am a big Patel fan. My son Taylor Trensch, who is a Patel alumni, is in the broadway show Matilda :). One of the Matildas (Milly Shapiro) is also from Tampa. Theater Guest Blog: Apprentice Boot Camp! Camps starting this week: Music, Voice and pre-K!